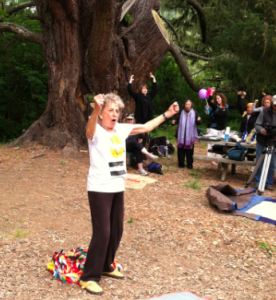 Just one of the miracles of Anna Halprin. Another was her ability to heal her own cancer through dance and imagery. Yet another is the sheer vitality of her physical and mental self as she nears age 94. She is still a leader, and where she goes, all kinds of people follow—dancers, drummers, authors. The outdoor, relaxed ambience reminded me of a family-style Woodstock, with people of all ages responding to the drumbeat. Instead of drugs, delicious and healthy homemade food was set out on tables. As a warm-up, Anna led us through simple shakes and reaches. She told us to “Put your mind into your body and ground yourself. 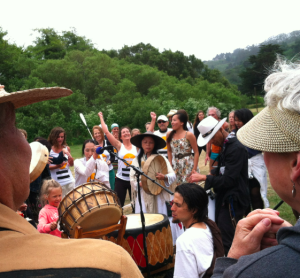 If you really connect to the ground, you’ll be as solid as a rock.” As we walked out to the field in two lines, the slow beat of the drummers echoed in the surrounding mountains. When the two lines split and created a huge circle, we then started running in three concentric circles. You changed your path depending on how fast or slow your body felt like going at that moment. But before you ran, you had to raise your arms and yell out what you were running for. With the designated theme of protecting our children, the first person ran for the children of Fukushima. The second person, from a group of Malaysian students, ran for the Malaysian child victims of the recent flight lost and never found. Another person ran for all homeless children, may they find love and shelter. I ran for children to be free of gun violence. The drummers pounded and chanted at the center of the circle—the eye of the storm—where Anna was quietly orchestrating their changes in pace. The drummers got carried away; we got carried away. With the drumbeat accelerating, the uneven earth commanding one’s attention so as not to fall, and the exhilaration of being among other runners (and walkers), it was easy to forget the purpose of the run. But at the end Anna brought us back to our purpose. She asked us to sit back-to-back with a neighbor for a few minutes, then face that person and tell her or him of our plans to bring our stated goal closer to reality. One could call the Planetary Dance a feel-good ritual. But built into the structure (or score, as Halprin calls it) is connection to your body, to nature, and to the challenges of a cause. 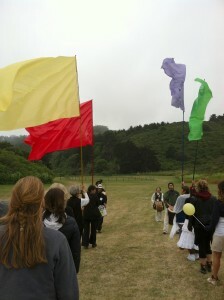 Ideally, the Planetary Dance, which last Sunday involved about 400 people, takes you from ritual to activism.